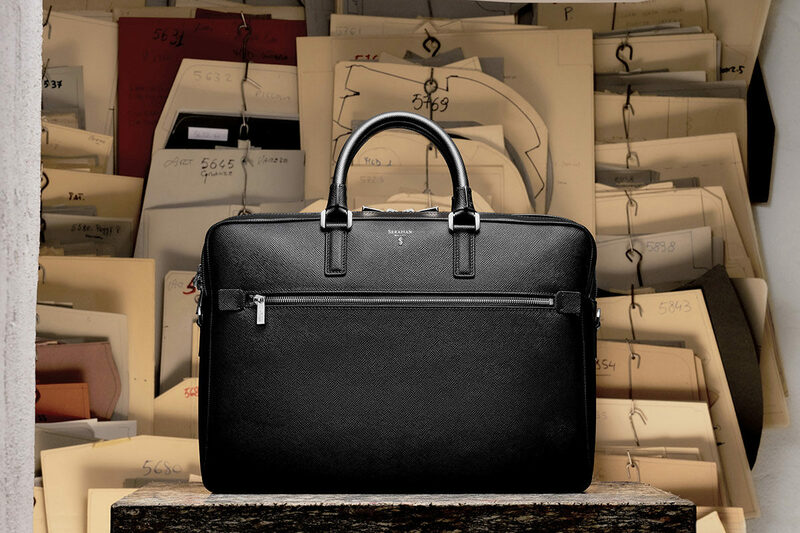 Serapian's Evolution briefcase is the ultimate expression of elevated business attire. With the relative ease with which we can scamper around the world these days, combined with the very necessity of business travel in the age of globalisation and multinational trade, we have taken zooming around in an aluminium can 35,000ft above terra firma somewhat for granted. The business traveller is always on, always moving, from the (depressingly slow) wifi of one hotel lobby to the next. This peripatetic and uniquely modern existence has necessitated a number of changes in business attire, not least the high-twist yarn suit that no matter how languorously you slump into your business class recliner, will barely register a crease. Comfortable yet no less smart than its office-bound sibling, the travel suit has become a sartorial genre all of itself. But perhaps even more critical for a discerning man on the move is his luggage. It takes a discerning eye to recognise the washable flannel merino of aZ Zegna suit, but a sumptuous and sophisticated bag never goes unnoticed. Whether it's a portfolio, tote, weekender or briefcase, a gentleman's bag is so much more than a mere ferry of paraphernalia - it is the outermost extension of taste and should always be in sync with both your business attire and your stature. The high-fliers in Milan have known this since 1928, when Stefano Serapian started designing and crafting fine leather goods in Milan. The historical Bespoke Atelier, still located today on Via Jommelli, has been crafting the finest leather bags and accessories Italy has known. Completely handmade in Italy, Serapian's craftsman are renowned for their skills with mosaic weaves, naturally tumbled calfskin, printed calfskin, and a very special 'Stepan' - a resin-coated waterproof monogrammed cotton developed in the 70s and exclusive to the Maison. While Serapian are the masters of bespoke commissions, we have secured this season's finest business-ready pieces for TheRake.com, perfect for elevating your Monday-Friday attire and making a statement wherever you happen to be travelling to. Shop the Serapian collection here at TheRake.com.